What do you mean by a tree conversation? A conversation arises in the space in between those who are having the conversation. It can bring something new if those involved are open to change. It can become a space that invites not yet thought of images, insights, questions and feelings that one or more of the beings involved in the conversation notice either during the conversation or upon reflection after the conversation is finished. A conversation, like a work of art, can spring to mind days, weeks, months even years later and can be a beacon of inspiration for important steps, decisions and commitments that we make in our lives. What about a conversation with a tree? Trees do not have the same physiological structure as humans, they don’t have organs such as brains, ears, larynx, a mouth etc. How do we communicate with non- human living beings? What are the “organs” we use with which we “speak” and “listen”. I am proposing, with the tree conversation work, that the heart is an organ of perception, and that Imagination is the language by which we can have conversation with non-human, non verbal beings. Many of us have experienced “communicating” with animals. There are some people who are called animal “whisperers” who can “understand “ the non verbal “language” of animals. There was recently a telesummit where 20 people from all over the world spoke of their research in communication with trees. This is something that is growing and is being shared more and more. The way I begin a conversation with a tree is by approaching the tree with my back turned and extending my hands into the space behind my back to greet the tree. I silently and inwardly ask permission to engage in a conversation. If I sense that I am welcomed, then I will sit at the base of the tree with my back leaning against the trunk. I have been refused on a few occasions and I know that I must only do this work with full permission. After all, in any conversation, the other parties must be free to choose to participate or not. This is particularly important with a tree which does not have the freedom of movement that animals and humans have. They cannot move away from someone who decides to lean against their trunk or climb up into their branches. 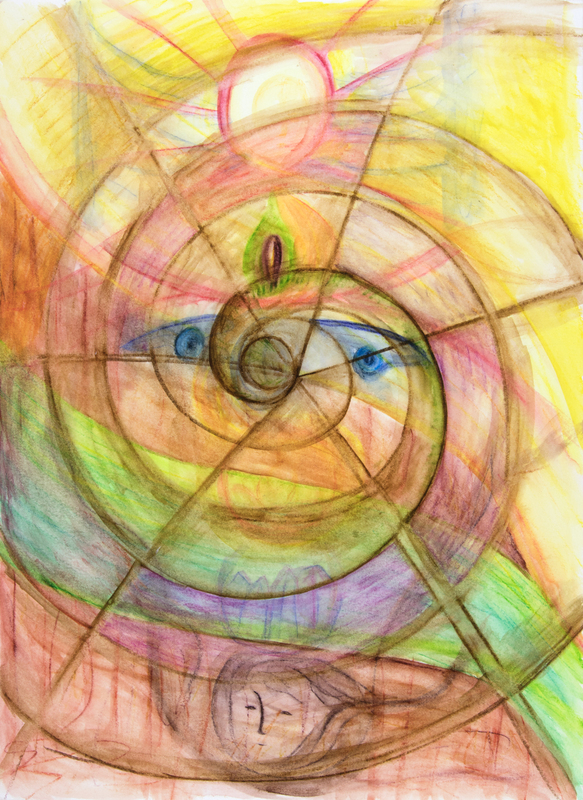 I set up my paper and inktense pencils and enter a meditation with my eyes closed. I direct my attention into my heart space. I carry that heart attention using my “Imaginative Cognitive” activity down into the centre of the earth and back up to my heart. I experience this as a centering and grounding. I then carry my heart attention further expanding it out towards the periphery of the cosmos, reaching and stretching as far as I can, and then I bring that attention back again into my heart space. Sometimes I have a question, or something is troubling me and I will bring this, imagining telling or showing the tree what I mean and I wait for a response. Sometimes I just open myself to listen to whatever the tree will share with me. Whenever I have the opportunity I will work with the same tree again on another day or even a year later allowing the relationship to develop beyond a first encounter. I find that my attention is directed to or I notice that I’m drawn to a certain colour, I sense a certain movement or form or line and I use the (Derwent Inktense) pencils to represent that to the best of my ability. I wet what I’ve drawn on the paper and let it dry. I return to my meditative, receptive state. Then I am attracted to another colour. I apply that to the page and then wet it. And I continue this for as long as I may. I find that if I have an hour or more then something really beautiful and complex can emerge. I still find the shorter conversations valuable. As in our daily lives we can have a powerful resonant conversation just waiting for the bus, or in passing on the street. A lot of importance can be conveyed and expressed in a short time. I would say for myself that I enjoy a nice long time of an hour or more…I suppose this is like wishing to have a couple of hours in a café with a good friend! I have, to date, April 2018, over 500 of these drawings made in 10 different countries. Canada, USA, England, Ireland, Wales, Sweden, Spain, Slovenia, Guatemala and China. Some are urban trees, others rural and some in wilderness settings. I feel I am just beginning, especially in terms of refining my capacity to understand the exchange and become “fluent” in the tree conversation! How do you know what is you and what is the tree? I have been working with more groups, introducing this way of connecting with trees. In a group, when more than one person is focusing on one tree, the results are consistent in one respect. When we look at the drawings which were created where the participants could not see the work of the others, we notice that each drawings is quite different and yet, THERE IS CLEARLY SOMETHING THAT UNIFIES ALL THE DRAWINGS. It is as if we can see the tree emerging out of the drawings altogether. I know the difference between when I am speaking in a conversation and another person is speaking. When you are having a conversation with another person often a thought comes up that you want to speak and you hold it back waiting until the other person is finished. In the tree conversation work there can be two images/ or thoughts simultaneously, just as in a “normal” verbal human to human conversation. In our inner world there are complex subtle differences in terms of our habitual thoughts, emotional reactions, conscious choosing of a response to our own emotions etc. I have worked over the years to become aware of these different aspects of my inner experience. This allows me to discern what is “my” part in the experience and what is coming from the tree. What are the implications if trees have a consciousness? The idea that the Earth is ecologically in crisis (even though there are those who deny climate change) is a concept that has penetrated popular culture on a global scale. Extinction of animals, infertility, toxins found in mother’s milk all over the globe, extreme weather events etc . Many individuals and organizations are trying to find ways to “fix” our mistakes. We wish to mend what is broken. I would argue that this situation arises as a culmination of the Enlightenment point of view that regards the Earth and all upon it as a conglomeration of material substance. In this world view there is animate (human and animals) and inanimate matter. Consciousness, to the degree that it exists at all, is an emergent property of the brain. This allows us to “use” the “resources” we find and can extract in any way that satisfies our desire for wealth, possessions and comfort. It is only possible to deal with the planet in this way if we believe that it is “inanimate” and lacking any consciousness. Because the planet is made of “stuff” we can do things “to” it. I propose that there are different forms of consciousness in the animal, plant and mineral kingdoms and ways of communicating with that consciousness. The result of recognizing this is that we cannot continue to “do to” the Earth. We know, or are coming to know, that when humans “do things to” each other there can be a violent outcome. Relationship requires that we do “with” each other. We can be interested in the experience of the other. We listen. We express. We have conversation and so can find our way forward with greater insight. The Earth is teeming with varied forms of consciousness that we can and will learn to communicate with. Trees, especially mature and/or ancient trees seem to be particularly accessible, perhaps closest to the consciousness that we call “thinking”. Many people have experiences with trees that include finding solace, renewal, insight or inspiration. Diana Beresford Kroeger, in her book The Global Forest shows us that the trees release volatile aromatic oils that are nourishing for our brains. There also seem to be networks of fungi carrying messages between trees on forest floors‎. Why does it matter what might be going on in the “consciousness “ of trees? Trees have been recognized as valuable in several ways. They provide building materials for homes/furniture etc. They can be used as fuel. They produce oxygen. They are a physical resource. Trees have been recognized as providing calm and solace. When we spend time in the woods we are revived and refreshed with a sense of well- being. They are a health giving emotional and psychological resource. I am discovering that trees can also provide inspiring thoughts and imaginations. They can be an intellectual and spiritual resource. They can be companions and co-creators on the path to a restored and healed ecology. If trees are in fact “conscious” then we are obliged to work with them out of respect, valuing their contributions to the future of the Earth. I have recently had the inspiration to support the trees in their “TREEFORESTATION” rather than what we think of as “Reforestation” . Let us include the trees and their insights in relation to forest creation and management! What is the difference between your images and hallucinations or the visions of a madman? The difference between my experiences and hallucinations are as follows; I am choosing to enter into this and can step in and out of it consciously and with intention. I am clear about different forms of consciousness and when to apply myself to what is thought of as “ordinary” day to day consciousness and when to apply this “imaginative cognition” consciousness. I am aware that the encounter with trees is not the same as an encounter with a human being, or a computer, or a dog. Discernment, conscious choice and a willingness to ask about the experience while completely accepting the experience as it is, is a confirmation of sanity. I am able to function in every day life, to work, to pay taxes, to form relationships, to be reliable and responsible. I value and develop my rational capacities as well as those that are non rational. I am sharing my experience, my point of view and the questions and thoughts I have out of doing this research. In the history of science and also of art, I have noticed that certain phenomena are thought of within a framework for a period of time and then, at some point, the framework or periphery (what is included and what is excluded from the paradigm) changes. In most cases it expands to include ideas that might have been known but excluded perhaps even ridiculed. Within the realm of art the periphery is created by working within the sense perceptible. In the artistic work of LifeNet the framework expands to include dimensions of reality that are pre-sense or extra-sensory perceptible. Can you connect with trees from a distance or do you have to be in the same place with them? I have friends who are supportive and they will send me interesting photographs or announcements of work being done around the globe with remarkable trees. I appreciate seeing the photos of these trees and I am not able to feel that I can “connect” with those trees and have a tree conversation. On the other hand, there are certain trees , in particular trees that I’ve met with repeatedly over a period of time, that I feel are receptive to me approaching them from a distance. The connection is not as clear or sustained as it is when I am sitting with a tree with my back against the trunk , but I do feel as though a connection has been made. It also seems to be the case that I can only do this AFTER I have been with the tree in person first. I will, occasionally let my attention be directed to certain trees that I particularly love and respect and send my thoughts of gratitude. I might also approach with a question related to work, to my inner life of meditation, my relationships etc. I will even ask about the tree conversation work! Do you have a stronger or more meaningful connection with certain trees? Each tree has a different outer perceptible form. The proportions, shapes of the trunk and branches, and the orientation in the landscape are unique. In speaking with people about their favorite tree they might describe a certain branch that they loved to sit upon. Even though trees may be of the same species/genus and thus have similarities there is not one that is identical to another. They have different inner qualities as well. Some are patient and kind, others irritable and like to taunt or tease. Some are wise and deep while others are frivolous. Some are thrilled to make contact and others are reclusive. These individual characteristics come into contact with my tendencies. And as with certain people, with some trees I feel completely at home, I feel welcomed and understood. I would even say, I feel loved and cherished. There are individual trees that I think about from time to time as one would a friend that lives somewhere else. There are some trees that have a grandeur, a majesty and wisdom. They carry a view that spans thousands of years into the past and into the future! The encounters with these trees are humbling and have a long lasting effect on me although I would not necessarily consider these trees as “friends”. Why do you make the drawings, why not just sit with the trees and then talk about what you experienced with them? I started asked myself what, if anything, does this work of tree conversations using art have to do with art as an expression of the development of human consciousness and society? Does this way of working have anything to do with new steps in what may become part of the world of art as it evolves? I have had enlivening and awakening experiences viewing art over the last 35 years. I’ve had the privilege of seeing art from many eras and also in many Western and Eastern countries. I was visiting the National Gallery of Canada with four young children ages 4-10. Children of this age are not inclined to a detailed look at individual paintings. The Gallery has a permanent collection that begins in the 14th century and moves, chronologically until present day. I trotted along keeping all four young boys within eye and ear shot. We covered the galleries at the rate of about one and a half minutes each! When we crossed the threshold from the late 1800’s into the room showing work from the 1900’s it took my breath away. Everything changed – colour, form, line, representation or lack of, brush work, size, content. It was a visceral experience. I went back and forth between these two rooms for a few minutes really drinking in this vivid contrast. The work beginning in the late 19th and early 20th century showed what came into the artist, made an impression and was brought back out again (Impressionism) or the work showed something of what the artist felt/experienced inwardly that was then brought out (Expressionism). Suddenly these two realms, the outer sense perceptible world and the inner hidden world were both involved and the art reflected attempts to navigate the boundary between them. I would describe The Tree Conversations as a new process of art that takes an additional step : I am active within my inner world (Imagination or what I called Imaginative Cognition) and with this activity I am seeking the equivalent inner Imaginative realm of the living world, in my case that inner world of a mature or ancient Tree. Out of this encounter I am returning to the sense perceptible world and recording an impression of the inner non- sense perceptible experience. There is an interesting new movement taking place in companies and organizations called Graphic Harvesting. In recognition that an image can capture and summarize a very complex idea, this is being used instead of written minutes to summarize the essence of the conversation in a meeting. After immersing myself in the inner, non sense-perceptible realms, I return to the outer sense world and express or communicate what I have experienced, much like that Graphic Harvesting, so that anyone can get a feeling for that encounter. They will form their own thoughts about it and the image based record encourages freedom for each viewer to discover what is aroused in them. How did you discover this way of working? A few years before The Tree Conversation work emerged in the form it has now I created something I called “Tree Gifts”. These were small wooden blocks covered in scraps of woollen blankets and covered in precious ornaments and attached to a tree using ribbons. I wrote this piece to accompany each tree gift . AN OFFERING of beauty, gratitude and attention to the tree where you will hang it…. 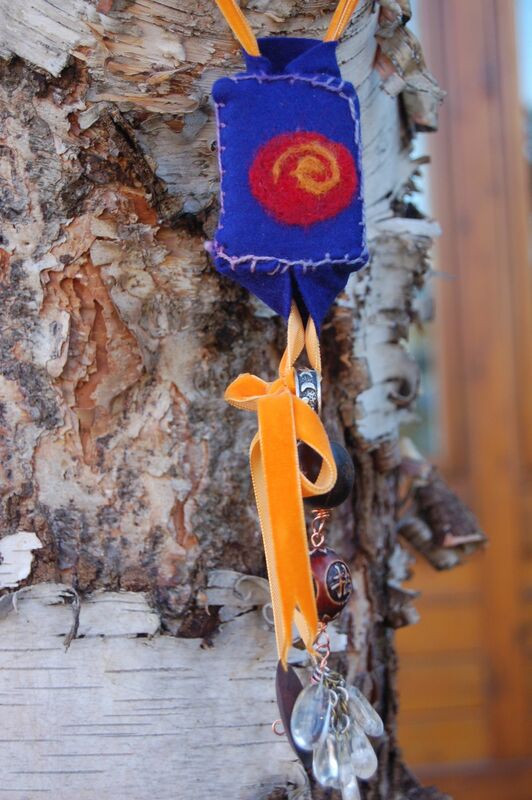 A PRAYER FLAG imbued with a sense of reverence, gratitude and respect for the living gift of the tree. ART created with a sense of colour, texture and composition to form a new synthesis that awakens interest in the viewer. ENVIRONMENTAL RESPECT in that all of the elements used were what I already had stored in bins, gathered from many places for various purposes. They now are enlivened and useful, resurrected to a conscious life. LEARNING, meant to arouse questions. What is that? Why is it there? What does it mean? Why is it on that tree and not any of the others? Does the tree have an experience of this gift? What in the tree is responding to the gift? What do I notice about the tree that I did not perceive before? And on and on. RELEVANT to our search for ways to connect to the living, healing aspect of the earth in order to know how to collaborate with this great being through a time of dramatic change. CONNECTED TO THE FUTURE in your choice of the one that you feel is best for a certain tree that you know and love. This is for relationship in that I ask that you take the piece that you are ready to commit to engage with, and hang it in a tree and then to explore the impact of the attention on your tree, on you yourself and in your community. Use this as an opportunity to explore your own immediate relationship to the living aspect of the earth. Keep a journal, have a picnic, take photographs, write poetry, talk with your neighbors, try to find other trees in Toronto that have these in them. Are there different ways to have conversations with trees? You refer to Imaginative Cognition. What do you mean by that term? This is a term that I take from the founder of Anthroposophy, Rudolf Steiner. He spoke of Imagination, Inspiration and Intuition as human capacities that we can cultivate and develop. When we undertake paths of self development to work towards an awakened self knowledge then these capacities grow and become available to us and they support our senses. We know that sense organs (e.g. the eye) can be educated or trained to become more able and to expand capacities of perception (in the case of the eye a training in art would be an example of this). They also can be struck by illness or affected by harmful practices or toxic substances. Eye function can weaken and even be lost. The inner “organs” of perception such as Imagination also can be strengthened and their function increased or equally they can be damaged , atrophied or destroyed. To the extent that I have developed my Imagination as an organ of perception, I am using that when I am entering into Tree Conversations. I mentioned earlier some of the ways in which I’ve educated and developed my Imaginative Cognition. It has developed gradually out of experience, study and practice over decades. As in any physical activity which can take place as a pleasant entertainment (such as going for a nice Sunday bicycle ride) one could also train for hours daily and enter into the Tour de France! Previous story The Tree of Life: Trees from my past. The butterfly tree.